A young Muslim girl spends a busy day wrapped up in her mother’s colorful headscarf in this sweet and fanciful picture book from debut author and illustrator Jamilah Tompkins-Bigelow and Ebony Glenn. 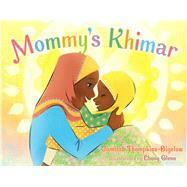 A khimar is a flowing scarf that my mommy wears. Before she walks out the door each day, she wraps one around her head. A young girl plays dress up with her mother’s headscarves, feeling her mother’s love with every one she tries on. Charming and vibrant illustrations showcase the beauty of the diverse and welcoming community in this portrait of a young Muslim American girl’s life.